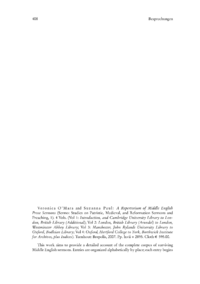 Veronica OMara and Suzanna Paul: A Repertorium of Middle English Prose Sermons (Sermo: Studies on Patristic, Medieval, and Reformation Sermons and Preaching, 1). 4 Vols. (Vol 1: Introduction, and Cambridge University Library to London, British Library (Additional); Vol 2: London, British Library (Arundel) to London, Westminster Abbey Library; Vol 3: Manchester, John Rylands University Library to Oxford, Bodleian Library; Vol 4: Oxford, Hertford College to York, Borthwick Institute for Archives, plus Indices). Turnhout: Brepolis, 2007. Pp. lxvii + 2895. Cloth  595.00. This work aims to provide a detailed account of the complete corpus of surviving Middle English sermons. Entries are organized alphabetically by place; each entry begins with a description of the manuscript and proceeds to an account of each sermon in it, generally with incipits and explicits, a summary of the content of the sermon, records of exempla and of verse included in it, lists of biblical citations, of proper and place names and a section of notes. There are final cumulated indices of proper and place names, as well as of authors, occasions, themes, concepts, biblical citations and exempla. In all, 1481 sermons are recorded in 162 manuscripts in a work running to 2962 pages.